Peter Elsdon teaches jazz at the University of Hull in the UK. His volume on well-known pianist Keith Jarrett is equal parts history, analysis, and anthropology. Taking as his topic Jarrett’s best-selling record from 1975 (indeed, the best-selling solo piano record in the world), the author seeks to explain the phenomenon of the album from several perspectives. The history of the recording is particularly interesting. 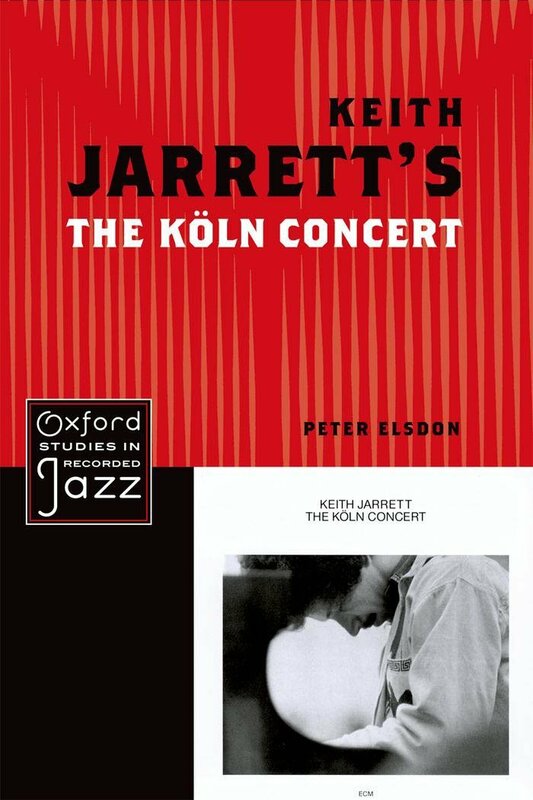 Contrary to the mythology surrounding The Köln Concert, which would have us believe that the concert was an unprecedented and unique moment of genius, Elsdon demonstrates that Köln was one stop among many on a European tour, and that Jarrett had played similar music at other venues. Also noteworthy is the fact that the arresting five-note figure that begins the concert may in fact have been a wry imitation of the Köln Opera House’s bell that sounded to alert audience members to take their seats. The piano itself was a wretched second-rate instrument that required significant audio processing before the record could be released. In other words, some of the mysteries and beauties which fans have in retrospect attributed to the event were not at the time especially mysterious or beautiful. Similarly, Elsdon shows that the final track on Köln was a song previously composed and not an improvisation; the manner of its listing on the album makes it appear as though it were a spontaneous piece created on the spot. Elsdon capably addresses the popular notion of improvisation as an elusive process in which the performer appears to create music not by manipulating pre-existing melodic and harmonic material, but rather by channeling music from some mysterious source. Jarrett himself has frequently reinforced this perception in interviews over the years, insisting that his improvisations involve no forethought and simply come to him in the moment1. Indeed, the idea of Köln as a prophetic utterance has enduring power that is evident when one considers that many younger pianists have learned it, note-for-note in its entirety, and performed it from memory on recitals. This is not to say that the author dismisses The Köln Concert as dishonest or pretentious; on the contrary, he explains its merits in detail. While Jarrett seems to be a controversial figure among improvising musicians — some consider him overrated while others nearly deify him — Elsdon evenhandedly explains several aspects of Jarrett’s musical language on Köln and puts forth arguments why, for instance, Jarrett’s long vamps can be heard not necessarily as pauses in the performer’s inspirational flow but rather as significant structural elements in large-scale improvisations. This part begins, as did the previous one, with a long groove passage, this time in F# minor. Harmonically this is rather different from the earlier passages, mainly by virtue of being in a minor key. It is given a distinctive hue through the use of the flattened sixth (D), creating an F# Aeolian modality . . . . [A]fter the initial two bars, the vamp settles into a pattern with the inside voice articulating a B/C# dyad against the left hand. Although this gives the harmony a suspended-fourth sound, the Aeolian inflections and the A pitches in the right hand define the harmony as minor 2. The fifty-page chordal, thematic, and textural description of the seventy-one minute performance may be of interest primarily to theorists and avid fans. The final section of the book explores ways in which listeners have appropriated the recording and changed its meaning through their own listening practices. Contrary to Jarrett’s desires, the album found great favor as a New Age landmark, due in part to its diatonic harmonic language and emotional immediacy. Jarrett bristled at comparisons between himself and New Age figures such as George Winston. Elsdon shows that once a recording finds its way into listeners’ hands, the artist is powerless to tell them what it means and how they should hear it. The author permits himself frequent digressions. For example, when the topic of New Age music briefly comes up, several pages on the history of that movement soon follow. Similarly, Jarrett’s interest in the ideas of Theosophy, the state of touring jazz combos in Europe and America in the mid-1970s, and numerous other subjects are given attention. Some readers may consider these forays prolix. Nevertheless, Keith Jarrett’s The Köln Concert is a serious treatment of the seminal event of Jarrett’s performance and recording from a comprehensive cultural, social, and theoretical perspective, and sheds significant light on the recording’s context and subsequent reception. Robert Hodson teaches music theory and jazz at Hope College in Holland, Michigan. His book addresses in detail the matter of how jazz soloists affect their accompanists, and vice-versa, in real time. Interaction in jazz has received prior scholarly attention as a primarily musical matter3 and as a manifestation of social and political dynamics4. Hodson seeks to extend the literature on this subject by offering close musical analyses of specific instances of jazz interaction. He begins by showing, by reference to recordings and his own meticulous transcriptions, how crucial actions by one player (such as the pianist) can change the tonal language choices of, say, the saxophone soloist. Comparing the solos of Miles Davis and John Coltrane, he suggests instances in which each player’s style transforms the rhythm section’s playing. His transcriptions and readings of solos by Charlie Parker, Dizzy Gillespie, Thelonious Monk, and Bill Evans likewise detail vignettes in which one musician’s action gives rise, in the moment, to sudden choices on the part of another. The book includes explanations of important jazz concepts such as twelve-bar blues. Hodson’s chart on page 56 comparing the simplest twelve-bar form with standard jazz blues and the far more elaborate “Bird Blues” would be useful for any scholar or student seeking to understand these important jazz forms. His elucidation of tritone substitution in the context of blues progressions is particularly instructive. The section on the musical function of each member of a jazz combo is similarly cogent. In m. 2, Davis embellishes a sustained G, the 13th of B-flat 7, with the lower neighbor F, the fifth. Moving into m.3, he again embellishes G—heard here as the 9th above F7—with an upper neighbor A, the third. After leaping up to the 13th (D) on the second half of beat 2, Davis leaps down to the sharped 11th (B) and then proceeds to fill the gap between them with a passing note C, a consonant 5th, which leads back up to the D, the 13th, on which he ends the phrase5. Hodson concludes by transcribing and analyzing moments of significant interaction in the free jazz of Ornette Coleman. Given the lack of prescribed harmonic progressions in this style, the author finds increasing levels of freedom among the performers to respond to each other’s musical gestures. Both books are ambitious in scope and free ranging in their treatment of topics. Elsdon seeks to understand a unique historic event from several perspectives, while Hodson applies a single analytical and interpretive lens to a breadth of musical examples. 1 Kevin Le Gendre, "Keith Jarrett - The Fine Art of Extra-sensory Improvisation." The Independent, (November 27, 2009). Accessed March 30, 2015. 3 Paul Berliner, Thinking in Jazz: The Infinite Art of Improvisation, (Chicago: University of Chicago Press, 1994). 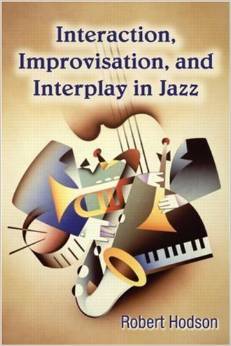 4 Ingrid T. Monson, Saying Something: Jazz Improvisation and Interaction (Chicago: University of Chicago Press, 1996). John Mortensen enjoys an unusually broad career as a performer and teacher of classical and jazz piano. His concerts may start with music of Bach, venture through several styles of music, and end with improvisation. He has performed with diverse artists such as Moscow Conservatory professor Mikhail Petukhov and All-Ireland fiddle champion Winifred Horan. His students learn a natural and coordinated approach to piano technique, which prevents injury and allows for unprecedented freedom and facility at the keyboard. He also performs and teaches Irish and American roots music, playing mandolin, octave mandolin, Irish flute, Irish button accordion, five-string banjo, Uilleann pipes, and Irish whistle. He created America's only college-level traditional Irish music session class.